There is nothing mesmerizing than watching waterfall. Waterfalls have impressive beauty of nature. One can feel the freshness after watching these free flowing waterfalls. These eye catching waterfalls are the treasure of nature. Below mentioned waterfalls is just a small list not any ranking. There are number of beautiful waterfalls in world. Here is the list of World’s most beautiful Waterfalls. Angel Falls is a waterfall in Venezuela and it is the one of the world’s most beautiful waterfall and world’s highest waterfall. This waterfall is named after Jimmie Angel, a US aviator who was the first person to fly over the falls. It is one of the top tourist destinations of Venezuela. Victoria Falls is a waterfall on Zambezi River on the border between Zambia and Zimbabwe. 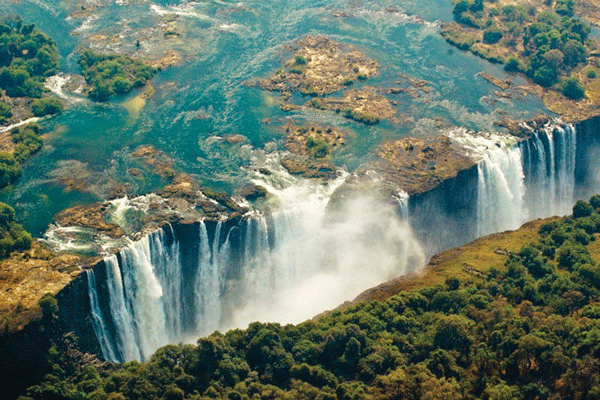 Victoria Falls is also known as the greatest curtain of falling water in the world. Local Tribe used to call it as Mosi-o-Tunya “The smoke of Thunders”. 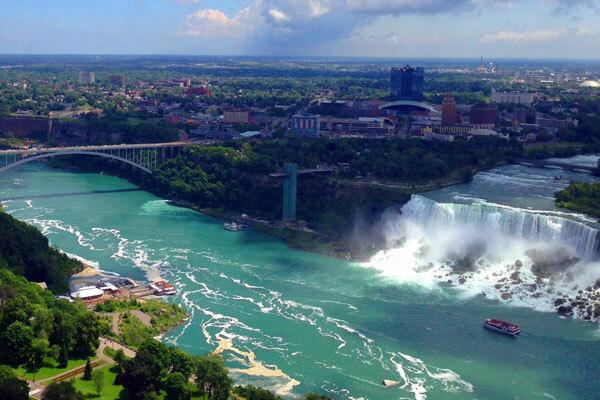 Niagara Falls is composed of three falls, American Fall, Bridal Falls and Horseshoe Falls. The Horseshoe fall lies between border of United States and Canada. Niagara Falls is located on Niagara River and it is among the world’s most beautiful waterfalls. Jog Falls is located on the boarder of Shimoga and Uttara Kannada district of Karnataka, India. Jog Falls is on the Sharavathi River. Jog Falls is the second highest plunge waterfall in India. It is one of the most beautiful tourist attraction and most beautiful waterfall in world. Iguaza Falls is located in Iguaza River on the border of the Argentine province of Misiones and the Brazilian State of Parana. It forms bourndary between Argentina and Brazil. 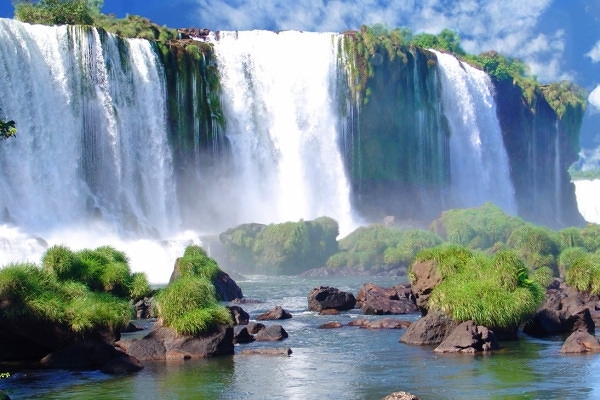 Iguaza Falls is among the 7 New Wonders of Nature and one of the world’s most beautiful waterfalls. 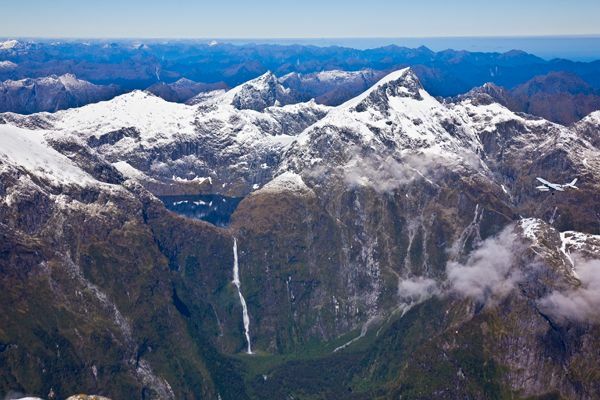 Sutherland Falls is one of the most beautiful waterfalls and it is located near Milford Sound in New Zealand’s. Sutherland Fall is the tallest waterfall in New Zealand. Kaieteur Falls is the world’s largest single drop waterfall by volume of water flowing. It is located on the Potaro River in the Kaieteur National park. Height of Kaieteur Fall is 741 feet. Wallaman Falls is located in the northern region of Queensland, Australia. It looks like horsetail waterfall. 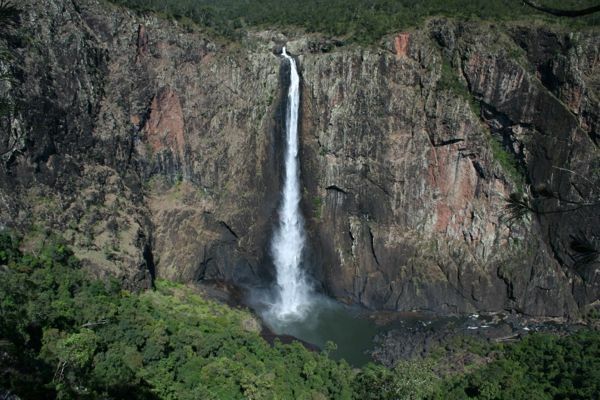 Wallaman Falls is part of the Wet Tropics UNESCO World Heritage Area and it is part of the oldest rainforest on earth. 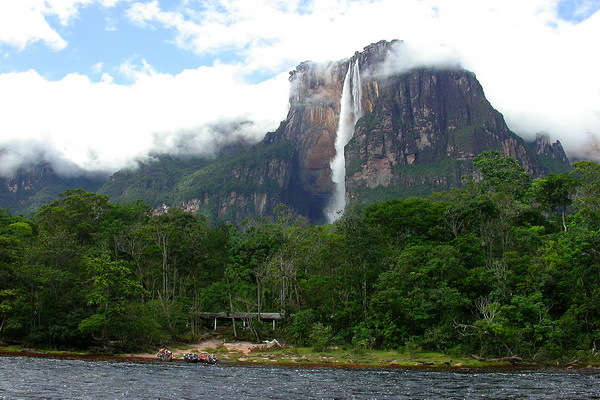 YUMBILLA Falls is located near the town of Cuispes in the Northern Peruvian region of Amazonas, Peru. 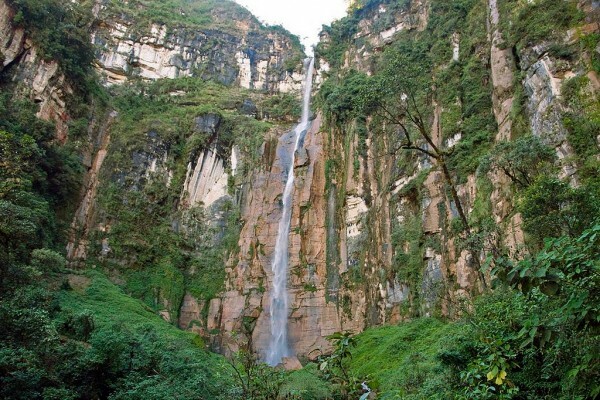 Yumbilla Falls is the fifth tallest in the world. Volume of water is very little and best time to visit Yumbilla Fall is during springs. 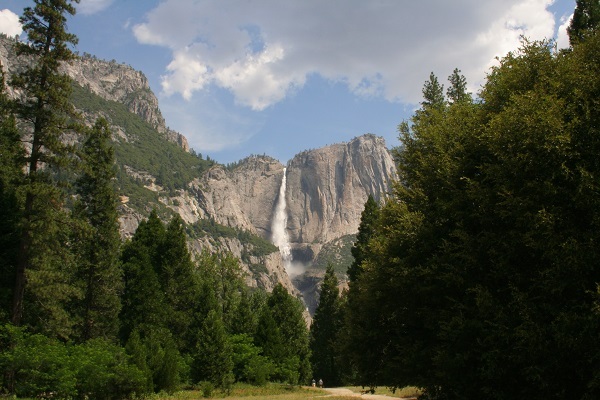 Yosemite Falls is one of the tallest waterfalls in world. Height of Yosemite Falls is more than 2425 feet. It is a cone shape waterfall. Yosemite fall is located in Yosemite National Park and it is the major attraction of tourist. It is the tallest waterfall in the United States and North America. Image source : Various sites. Your suggestion are required so that we can add some more beautiful waterfalls to this list. They truly are mesmerizing…I love waterfalls ! Waterfalls are always nice and beautiful. Thanks for your comment. Good day. Thanks for your suggestion and for your comment. Good day. Wow beautiful! I’d be happy to bust at least 1 of these waterfalls! Thanks for sharing! Yes, all of them are amazing. Thanks for your comment. Good day. Sorry that was a typo! I meant “visit at least 1” lol. You enjoy your day as well! 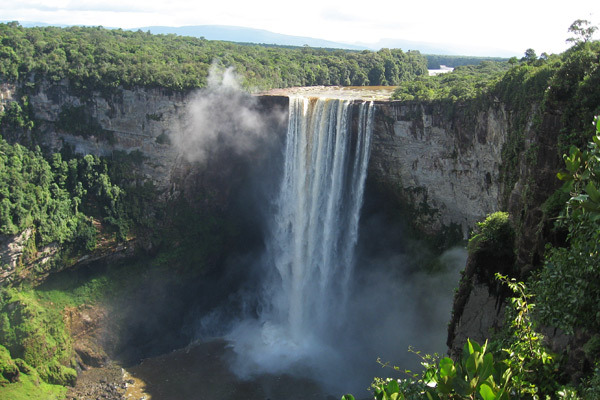 Kaieteur Falls is in Guyana. I think Angel Falls is our favorite. It looks as though the water is falling from heaven. Wonderful blogpost. Thanks a lot for your lovely comment. Good day. Excellent post! We were recently in Norway. The sheer quantity of waterfalls in the fjords were amazing. Sometimes you could stand in one place and count 30 or more. Thanks a lot for your lovely comment. Good day and keep in touch. My pleasure and thanks for visiting my blog. beautiful pictures. I am a fan of waterfalls. I love waterfalls! they are one of the most amazing nature ever happened. Thanks for such a lovely comment. Good day. Beautiful photos thank you for sharing! I love waterfalls! Yes, waterfalls are really beautiful. Thanks for visiting my nlog. Thanks a lot. Keep in touch. Take care. Thanks a lot. Good day. Thanks for your comment. Good day. Adevărate minuni ale Cerului. Vă mulțumesc mult pentru postare! Magnificent! I went in Yosemity! Wow, thats great. Thanks for your comment. Beautiful post! I always am in search of a new waterfall to chase! Yes waterfall is one of the most beautiful creation of nature. Thanks a lot for visiting my blog. Good day and keepnin touch. Iceland has plenty of beautiful waterfalls. Thanks for such a lovely comment and your video link. Really beautiful collection. Thanks a lot for you lovely comment and visiting my blog. Thanks a lot for your lovely comment. Keep in touch. Yes place full of treasure. Thanks for visiting my blog and your valuablE comment. Thank you for visiting and following my blog. Your blog is diverse and great. I look forward to reading and seeing some more of the world. Thanks a lot. Keep in touch and good day. Thanks a lot and keep in touch. Thanks for your lovely comment and visiting my blog. Good day and keep in touch. Wow thanks a lot for such a wonderful list. Good day and keep in touch. Thanks for sharing these incredible waterfalls. It is indeed like reaching out to touch God’s face. Thanks for visiting my blog and your lovely comment. Good day and keep in touch. God’s majestic beauty is awesome! Remembering God’s creative beauty when sadness overshadows you lifts the spirit and the sadness dissolves.. Thank you for sharing. Thanks a lot for such a lovely comment. Beautiful pictures! Thank you for following my blog. Those waterfalls are just awesome and beautiful! Thank you for following my book blog! Thanks a lot for such a beautiful comment. Beautiful Post with great information. In the above list, I have visited NIAGARA FALLS(from US) and YOSEMITE FALLS. Both are gorgeous beauties. Hope to visit much more waterfalls in future. Thanks for sharing. My favorite is the Venezuelan Falls. That’s great. Thanks for visiting. This is a gorgeous collection of waterfalls. I would love to be able to see them all. Yes beautiful, all of them. I grew up near Niagra falls and it is one of the most beautiful places in the world. Beautiful photos of beautiful waterfalls. I like Victoria Falls if I had to pick a favorite. The waterfall I enjoyed seeing the most was the Yellowstone Falls on Yellowstone River. The whole area is magnificent. There is a small one down the river that you can stand under. That’s fun for the family. Wish I could remember it’s name. Hi.. loved the post. But personally I loved the look of Iguazu falls to Angel falss. Thats really mesmerising. Le monde a des beautés qui faut préserver. Oh you’ve added places on my bucket list. I’ve only been to Niagra and Iguazu Falls. Waterfalls are fantastic! Thanks for posting! Thanks a lot. Good day and keep in touch. Thanks a lot for your suggestion. Yes Bigar Waterfall is also one of the best. I love waterfalls! Thank you for the fabulous post!!!! Thanks a lot . Keep in touch and take carw. This is beautiful! Would so love to visit all the waterfalls listed. I’ve been to none of these waterfalls. Yes these are must visit places. Thanks and keep in touch. Yes waterfalls are best place to relax and refresh. You should experienced it at earliest. Really these are wondeful and eye-catching. Oh my gosh I want to go see all of those! Definitely all of them are beautiful. Thanks for your lovely comment. Good day and keep in touch. Thanks a lot and good day. Yes sure. Thanks for your comment. As my sister would have said it, God’s creations are beautiful! Thank you, tripambitions. You have made the world a more beautiful place by sharing these awe-inspiring, yet calming natural wonders. And thank you also for the information, which expands my understanding of waterfalls. Oh that great. Thanks for your comment. Thanks for checking out WordSisters! I like the idea of your blog–very inspiring! Thanks a lot for lovely comment. Yes its amazing. Thanks for your words and good day. I I agree, nothing is more restful and peaceful than connecting with water. Beautiful photos. Thank you so much for the follow. What a wonderful gallery of waterfall pictures. Thank you for posting. Welcome to that little voice, and thank you for following my blog. Thanks for visiting my blog and your valuable comment. Good day and keep in touch. Yes these waterfalls are really beautiful place to relax. where is that water falls? Thanks a lot for your lovely words. Good day and keep in touch. the most beautiful ones are the ones that has yet to be touched by humanity. Yes, this world is full of hidden treasure of nature. Good day and thanks for your comment. I Love waterfalls. ‘Even if at times they inspire a need to visit a W.C water closet’. Yes waterfalls are most beautiful creation of nature and God. Thanks a lot for your such a lovely comment. Sure you will visit all these places soo. Take care and good day. This is so great! You awakened the ever-present wanderlust inside me, which got distracted with a lot of sad the past year. Thank you so much for sharing these beautiful shots and a taste of all theat is extraordinary out there! All of our life is full of some hurdles and its better to forget the past and live your present happily. Keep exploring and keep in touch. Good day. Take care. Wow! 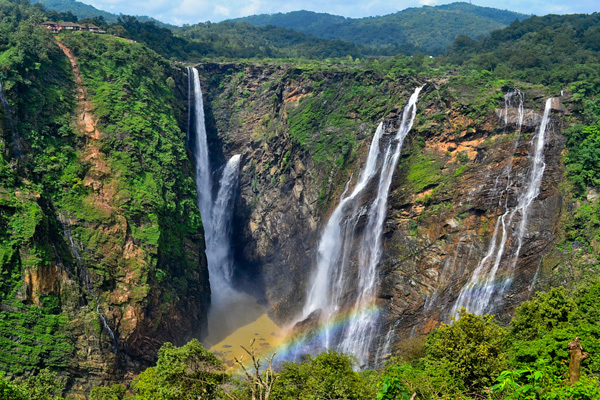 Catch the rainbow at the bottom of Jog falls. Yes almost at every waterfalls we can see formation of rainbow. Most beautiful n amazing waterfalls as singinging some love song. Thanks for your lovely words. Good day and keep in touch. Nice share, they are all very Stunning! I think I like Iguazu Falls best! So beautiful …. Like I am flying in these places….. Same to you dear !!!!! Nice article!Thank you for posting this kind of informative article. Keep posting this kind of useful articles. To visit more places in Nanded or any other destination in India Book taxi service or cab service now at ganraj Travels at very reasonable cost. Ganraj travels is one of the leading taxi and cab service provider in all over india. Hurry up! Been to Iguassu and Victoria Falls. Fell in love with Iguassu. Victoria would’ve been a great experience if the Devils Mouth was opened but it was a closed season. Wow! And here I thought our waterfalls in Hawai‘i were cool! These are amazing!